The new rail facility at our head office is enabling us to further develop our rail-specific CPT rigs and equipment. 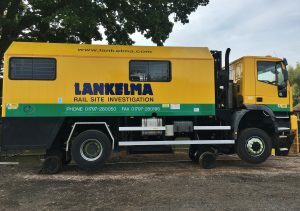 “CPT has been used successfully on railway investigations across the UK in recent years,” said Lankelma General Manager Chris Dimelow. “We have developed on-track plant and equipment designed specifically for investigations in the four main rail environments: track bed, embankments, tunnels and stations. This includes our CPT rail truck and our UK14 excavator-mounted unit. Lankelma’s CPT rail units can be used with the full range of standard and specialist cones, can take samples and be used to install instrumentation. Provided there is sufficient reaction force and a power supply, CPTs can be carried out almost anywhere in the rail environment.